England’s cricketers and travelling supporters and media were in for a shock when they landed in the Indian capital of New Delhi for the ODI leg of the tour last week. Temperatures have been near-freezing for the past week in New Delhi with some of the border towns seeing sub-zero weather. There was even talk of snow descending on New Delhi for the first time in recorded history. Sunday’s ‘warm-up’ match at Delhi’s Palam ground (near the old domestic airport) at which England lost to India ‘A’ was anything but warm – the ground was enveloped by a thick sheet of fog for most of the day game. At the main Delhi ground of Feroze Shah Kotla on Tuesday for the second warm-up which started at 12 noon, the fog had lifted but it was still bitterly cold, even in the closed-off press box. Just how cold? 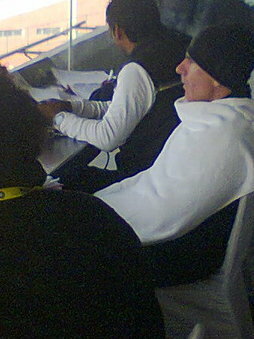 Even colder than London and Cardiff – forcing cricketer turned journalist, Welshman Steve James to wrap himself up in a huge, thick towel much to the amusement of the press corps. His photo is already all over Twitter! Another thing that did not change on Tuesday – England lost their second and final warm-up. The official ODI series begins at Rajkot, Gujarat on Thursday.